Which is better: Ice cream or gelato? Ounce for ounce, gelato is better. It has fewer calories and less sugar than ice cream. Gelato also has half the fat of ice cream because it’s made with milk, not cream. That’s according to registered dietician Lauren Slayton. Plus, she says ice cream is less filling than gelato! Because it’s not as dense and has more air, so the flavor is less intense than gelato. That’s why people tend to eat MORE ice cream, while they’re likely to be satisfied with less gelato. Frozen treats actually HELP migraines! That’s because eating something frozen lowers the brain’s temperature. That constricts blood vessels and can shut down head pain. According to the University of Hawaii, this “brain chilling” effect reduces migraine pain by over 30% in 30 minutes. 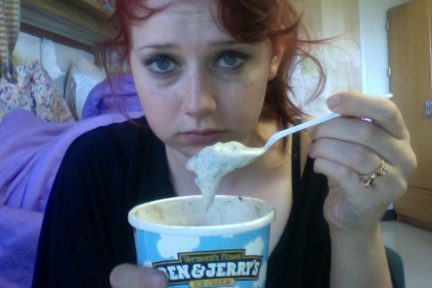 Don’t watch a tearjerker and break out the Ben & Jerry’s at the same time. Because when we’re already feeling sad or depressed, we can’t taste fat as well. So it’s less satisfying, and we tend to overeat to get the taste we crave. If you can’t watch “The Notebook” without some Chunky Monkey, make sure you dish out a single serving, so you don’t eat the whole carton.